IAIN MACHELL Drawings and Sculpture - Site-Specific Installation "Common Ground" for "Close To Home" AIDS Project, Mesaros Gallery, West Virginia University. Site-Specific Installation "Common Ground" for "Close To Home" AIDS Project, Mesaros Gallery, West Virginia University. This installation was set up in a gallery closet space as part of the exhibition "Close to Home: Collaborative AIDS Projects". 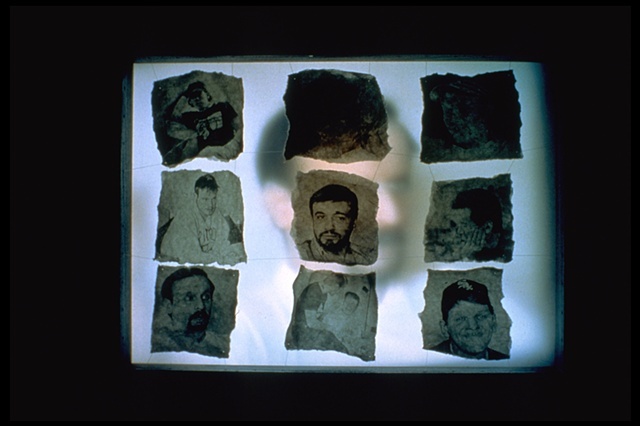 A silent video monitor displayed HIV infected individuals talking about their experiences, their words thrown onto the closet walls in enlarged text. Black-and-white photographs from collaborative discussions were exposed onto handmade paper and stitched together across the faces on the video monitor, echoes of the fragile yet tenacious lives of the participants in this project.